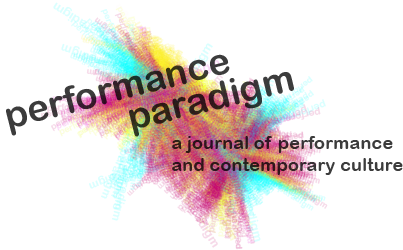 Like Bartleby, the legal clerk who famously decides that he would prefer not to, this issue of Performance Paradigm—an open-access, peer-reviewed journal now in its 14th year—investigates the politics and performance of non-participation. The figure of Bartleby appears everywhere in political theory and philosophy: in Gilles Deleuze’s “Bartleby, ou la formule” (1989); in Giorgio Agamben’s companion piece (1993; published in English 1999); in Michael Hardt and Antonio Negri’s Empire (2000); and in Slavoj Žižek’s The Parallax View (2010). In performance, his spirit manifests in Noor Afshan Mirza and Brad Butler’s project Museum of Non-Participation (from 2007). In performance scholarship, he recently appeared in Daniel Sack’s After Live: Possibility, Potentiality and the Future of Performance (2015). Perhaps we hear him in phrases such as “don’t do it on my account” and catchphrases such as “computer says no”. We might even see him, his slogan printed on a bag or a t-shirt. What are we to make of the fact that more than 160 years after Bartleby first appeared, both pizza ads and productivity coaches proclaim: “No is the new yes” (Huffington Post 2012; Kellaway 2017; Schwartz 2012)? And what is the difference between the “no” and the “non” when it comes to participation? One can choose not to participate (refuse) or one may be excluded from participation, which is altogether different. Is to refuse important in and of itself or should it build towards action; is it, in fact, more a type of action—a striking against—than non-participation? This issue of Performance Paradigm takes the 2016 Biennale of Sydney as a starting point for a broader discussion about the relations between performance, choreography and the gallery. Of course, the appearance of performance in the gallery and in the GLAM (galleries, libraries, archives and museums) sector more broadly is not new. Indeed, the Biennale’s 2016 artistic director Stephanie Rosenthal and two of her ‘curatorial attachés’, Adrian Heathfield and André Lepecki, have been working at this intersection for years. So too have scholars such as Claire Bishop (2012; 2014), Shannon Jackson (2011), and Susan Bennett (2009). Taking its cue from the title of Caryl Churchill’s recent play, this issue investigates the performance, politics and dialectics of “love and information”. In his review of the play, Michael Billington observed that, “we live in a world where information bombardment is in danger of leading to atrophy of memory, erosion of privacy and decay of feeling.” Yet his criticisms are couched in binaries that the play itself, and contemporary performance more broadly, challenges, unsettles, disrupts and even refuses. In an age of big data, small screens, social media and algorithmic match-making, can we really separate liking and “liking”? Even if we could, are we comfortable with the implicit hierarchies of co-presence here? If technology has become, for better or worse, an “architect of our intimacies” how does performance respond to, reproduce or resist both those architectures and those intimacies? Performance practice since the 1990s has been characterised by an increased interest in the phenomenon of theatre without professional performers. Such performers are selected for a variety of reasons, including: their life experiences, their status as specialists in spheres of expertise other than that of art performance, and their connection to particular social categories such as economic class, field of work, ethnicity, age, and (dis)ability. In the work of companies such as Rimini Protokoll these performers are referred to as both ‘protagonists’ and ‘experts of the everyday’. In her recent study of participatory art, Claire Bishop gives the label ‘delegated performance’ to the tendency to hire such people to perform on behalf of the artist (2012: 219). The currently prominent modes of staging real people* recall, modify or challenge a diverse range of traditions and genres, from realist, documentary, and Dadaist experiments to popular entertainment forms including gladiator fights, freak shows, and most prominently today, reality television.